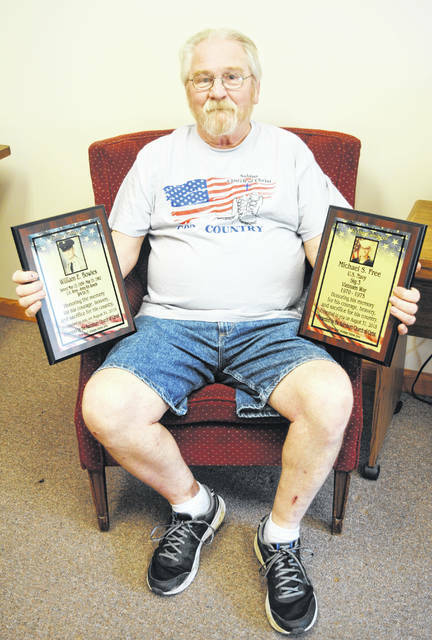 Don Bowles holds a couple of the plaques he will present during a ceremony Friday in Rainsboro. Don Bowles never served his country as a member of the military. But for the past seven years, the Greenfield resident has been serving in his own way by honoring veterans and active-duty service members with what he calls God and Country rallies. This Friday during a 6:30 p.m. ceremony at the Rainsboro Church of Christ, he will deliver 17 plaques to former and current service members from the Rainsboro, Hillsboro, Greenfield and Bainbridge areas. The event is open to the public. Bowles has had a special fondness for those in the military since he was a boy. And it wasn’t for lack of trying that he never served. He said he enlisted four times and was drafted once, but was rejected all five times because he had “flat” feet. His fondness for military personnel started years ago when one of his older brothers came home on leave from the service. Bowles said he attended his first God and County Rally in 2010 when a friend from Columbus invited him to one. He started holding his own rallies the next year, and has held four in Sabina, three in New Holland and one in Frankfort. Friday will mark his second rally in Rainsboro. He said Friday’s rally will include patriotic music from the Unified Christian Men’s Choir, a couple speakers who are former service members, a display of military flags and the presentation of the plaques. The plaques, Bowles said, are awarded to veterans, the family of veterans who have passed on, and current military personnel. He said he sends out fliers and contacts local churches searching for people who would like to see a current or past member of the military honored, then has plaques made by Jett’s Embroidery in Greenfield for those who respond, mostly at this own expense. The plaques contain information including the name of the military member, their branch of service, rank, years served, whether they are living or deceased, and a few words of tribute. Bowles said he’s had 85 to 90 plaques made so far and has no plans to stop. “This is my enjoyment, doing as many of these each year as I can do,” Bowles said. When he held his first rally, Bowles said he didn’t know if he would get much of a response. But then two “full bird colonels” showed up for the rally. But his favorite response, Bowles said, came from a Sabina man to whom he presented a plaque. “He said, ‘This plaque means more than the Purple Heart. This was given to me by loving people. The Purple Heart came from the government,’” Bowles said. Those receiving a plaque Friday in Rainsboro include: Pauline Bengston, U.S. Air Force, 1941-46; Wilber D. Bengston, U.S. Air Force, 1941-46; Ray McCauley, U.S. Army, 1957-59; Lt. Col. Charles L. Stiles, U.S. Air Force, 1987-2004, Ralph Scranton, U.S. Air Force, 1952-56; William E. Bowles (Don’s brother), U.S. Army, 1959-62, Frederick Lewis Steiner Jr., U.S. Army, 1941-45; Gail Taylor, U.S. Army, 1952-54; David Taylor, U.S. Army, 1976-78; Ronald E. Leasure, U.S. Navy, 1956-60; Fredrick Lewis Steiner Jr., U.S. Army, 1960-64; Keith Stevens, U.S. Army, 1991-95; Billy M. Gilbert, Coast Guard, 2002-present; James A. Mettler Jr., U.S. Air Force, 1972-76; Oldham Hollon Jr., U.S. Army, 1955-57; Michael S. Free, U.S. Navy, 1971-75; Robert E. Howard, U.S. Army, 1951-57. For more information Bowles can be reached at 937-919-4460 or 620 S. Washington St., Greenfield, Ohio 45123.
https://www.timesgazette.com/wp-content/uploads/sites/33/2018/08/web1_Don-Bowles-pic.jpgDon Bowles holds a couple of the plaques he will present during a ceremony Friday in Rainsboro.